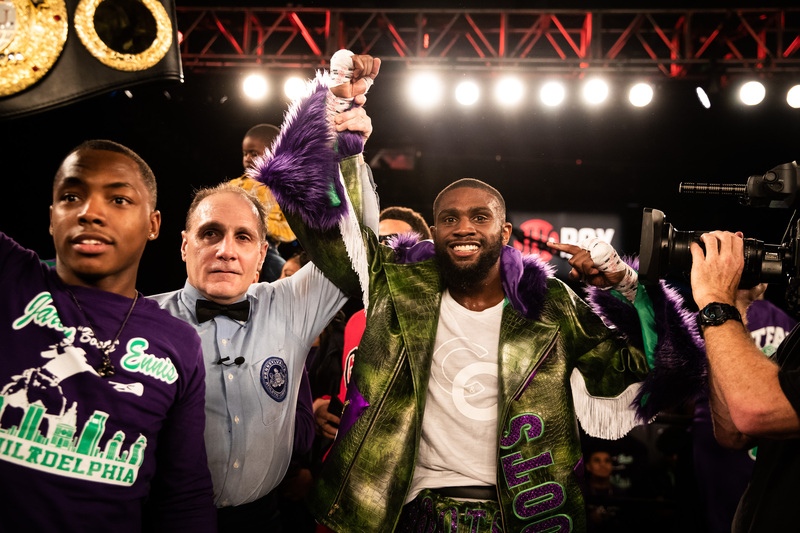 The main event of the telecast – which featured five ShoBox veterans and three fighters who call Philadelphia home – did not last long. The battle-tested Serrano (24-6, 10 KOs), whose six professional losses have come against opponents with a combined fight night record of 111-1-1, proved to be no match for Ennis. The flashy southpaw with a deadly combination of speed and power scored three highlight reel knockdowns in round two, and capped off the night with an explosive uppercut to the jaw. The 21-year-old Ennis (22-0, 20 KOs) has now knocked out 12 consecutive opponents and has proven his worth as one of boxing’s brightest prospects. “It was a good fight, I was just in there having fun,” said Ennis, who is trained by his father Bozy. “My dad said to start touching the body and that set up the big shots. That’s exactly what I did. In the middle bout of the tripleheader, Philadelphia’s Sam Teah (14-2-1, 7 KOs) energized the hometown crowd by putting in a dominating performance en route to a unanimous decision (79-73 and 77-75 twice) over Chicago’s Kenneth Sims Jr. (13-2-1, 4 KOs). Click HERE for the highlights. Cheered on by chants of his nickname “Tsunami”, the 31-year-old Teah utilized his jab and set the pace throughout the eight rounds. Executing a clever game plan, Teah beat the volume-punching Sims at his own game as he averaged nearly 86 punches per round to Sims’ 59. After an even first two rounds, Teah began to pull away, as he landed 164 punches to just 91 for Sims in rounds three through eight. Teah grew stronger throughout the fight, and put the contest out of question in the final two rounds as he out-landed Sims, 53-28. In the telecast opener, undefeated Ukrainian prospect Arnold Khegai (14-0-1, 9 KOs) kept his unbeaten record intact with a hotly contested unanimous decision win over New Brunswick, N.J. native Jorge Diaz (19-6-1, 10 KOs), who announced his retirement immediately following the fight. The judges scored the fight 79-72, 77-74 twice. Click HERE for highlights. Khegai, known for his aggressive come-forward style, stayed true to his reputation by pressing the action early. Despite suffering a cut over his left eye after an accidental clash of heads in the fourth round, Khegai was more accurate in all phases while Diaz’s activity made the fight competitive throughout the first five rounds. Khegai dazed Diaz in the fifth with a big left hook and followed it up by scoring the only knockdown of the fight in the sixth, landing a combination that forced Diaz to a knee. Tied at 122 total connects after seven rounds, Khegai clinched the fight with a huge eighth and final round where he landed 31 power punches to just 13 for Diaz. “I’m very excited to get the win against a very uncomfortable fighter,” said Khegai through an interpreter. “He was tough and I had to stick to my game plan. He was doing different things and leaning in with his head. My main idea was to win the fight and I tried to get the knockout. Tonight’s tripleheader was promoted by Victory Promotions in association with Hard Hitting Promotions. The full telecast will replay on Monday, November 19 at 10:30 p.m. ET/PT on SHOWTIME EXTREME and will be available on SHOWTIME ANYTIME and SHOWTIME on DEMAND. Barry Tompkins called the action from ringside with boxing analyst and historian Steve Farhood and former world champion Raul Marquez serving as expert analysts. The executive producer was Gordon Hall with Chuck McKean producing and Rick Phillips directing.